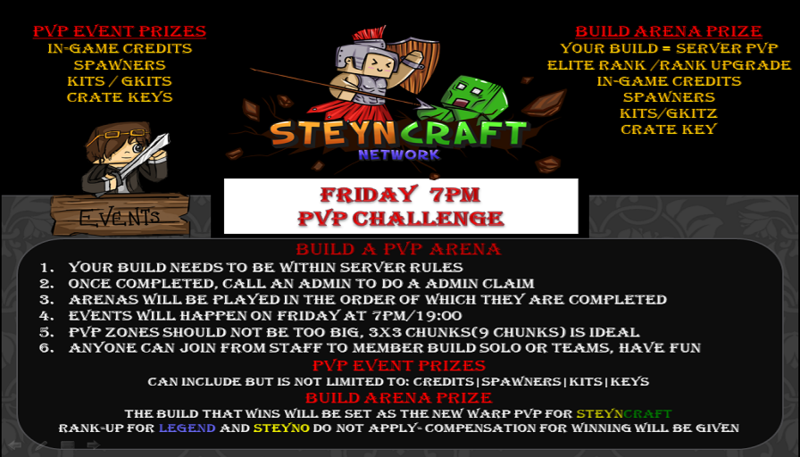 Steyncraft is a community based, Family frendly server. Steyncraft boasts a unique skyblock experience. Spawners remote hoppers and furnaces and some custom island setups. Island upgrades include the following fly, crop grow boost, spawner boost and island size. by voting for our server . BE AWARE WE ARE NOT MOJANG , NOT ASSOCIATED WITH MOJANG ,AND NOT SUPPORTED BY MOJANG. FOR QUESTIONS, CONTACT STAFF WITH OUR WEBSITE TICKET SYSTEM. SteynCraft is a privately owned server and will not allow any recordings on the servers neither posting of such videos in any form without the express permission of the owner. SteynCraft will further not tolerate any threatening or insulting behavoiur towards the owner, the server staff or its members.